Abandoned Whaling Station, Whaler’s Bay,Deception Island, South Shetland Islands, Antarctica. “A Touch of Nature” photographs series featured at the North Carolina Museum of Natural Sciences’ Nature Art Gallery, March – April, 2018 . All rights remain the property of Norma J. Longo. “Whale bones and the deteriorating remnants of a whaling boat are evidence of the grisly work performed here in Whaler’s Bay, the site of a Norwegian whaling station from 1912-1931. Scientific research stations still operate here. 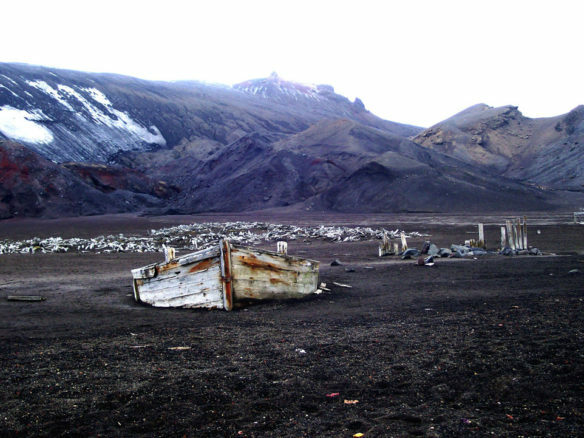 Whaler’s Bay is inside the caldera (a collapsed volcano filled with sea water) of Deception Island. This caldera is still considered an active volcano, with its latest eruption in 1970. Lava flows, pyroclastic deposits, and glaciers are found on the horseshoe-shaped island, and in some places, steam rises from the dark volcanic sand beach and the water, evidence of heated rocks below the surface. On exhibit at the North Carolina Museum of Natural Sciences’ Nature Art Gallery March 2 through April 1, 2018. (RALEIGH, N.C.) — Photographer Norma Longo looks for beauty and shapes in the landscape, particularly in geologic landforms, and then captures images using a point-and-shoot technique. The photographs in her latest exhibition, “A Touch of Nature,” are favorites from her world travels and will be on exhibit at the North Carolina Museum of Natural Sciences’ Nature Art Gallery March 2 through April 1. A Gallery reception for the artist will be held Saturday, March 3, 2-4 p.m. All exhibited art is for sale. Longo’s interest in and respect for nature show in her work. A native of the upper Shenandoah Valley of Virginia, Longo has been a North Carolinian for more than a quarter century. As a youngster, watching her brother work in his darkroom, she was fascinated by seeing images appear on paper doused in a pan of liquid. She started using her Mother’s Kodak Brownie box camera, then through the years progressed through instant cameras to “real” cameras with various lenses, and finally to digital cameras. Norma’s photographs of various beaches around the globe, including those that are affected by human intervention and are environmentally challenged, are published in several of coastal geologist Dr. Orrin Pilkey’s educational books, and in Beach of the Month features at coastalcare.org. The Nicholas School of the Environment at Duke is displaying some of her images, and they were also shown in a group exhibition, “Global Perspectives, Part Three — Faces of the Earth: Landforms, Seascapes and Ecosystems,” presented by the Friends of Carrboro Branch Library and the Orange County Arts Commission. The Nature Art Gallery is located inside the Museum Store. Hours are Monday through Friday, 10 a.m. to 4:45 p.m.; Saturday, 9 a.m. to 4:45 p.m.; and Sunday, noon to 4:45 p.m. Admission to the Gallery is free. All exhibited art is for sale. For more information about the Nature Art Gallery, call 919.707.9854. The North Carolina Museum of Natural Sciences in downtown Raleigh (11 and 121 W. Jones St.) is an active research institution that engages visitors of every age and stage of learning in the wonders of science and the natural world. Hours: Monday–Saturday, 9 a.m.–5 p.m., and Sunday, noon–5 p.m. General admission is free. Emlyn Koster, PhD, Director. For more information, visit naturalsciences.org. “Écume”, is an image from Santa Aguila Foundation. “Patagonie”, is an image from Santa Aguila Foundation. “Figure de Silence, Soupir”, is an image from Santa Aguila Foundation. Breaking Free, is an image from Santa Aguila Foundation. Turquoise, is an image from Denis Delestrac. “After the storm,” is an image from Andrew Jalbert. Abandoned Whaling Station, Whaler’s Bay,Deception Island, South Shetland Islands, Antarctica, – From “A Touch of Nature ”Series, is an image from Norma J. Longo. Concave Iceberg Gerlache Strait, Antarctica – From “A Touch of Nature ”Series, is an image from Norma J. Longo.